I have always loved camping. From “camping out” in lawn chairs and sleeping bags in our back yard a few feet from the house to trips to Clarks Hill with the family setting up a big Army Surplus tent, I enjoyed my time outside. When I started bass fishing, I camped in tents at lakes the night before a tournament. Then I bought a cargo van in 1977 and fixed it up with a bed and used it. Two more vans took me to the lake many times, each one converted a little better for my needs, until last March. My old back finally convinced me I wanted to be able to stand up to get dressed, so I got a slide in pickup camper. It takes a little more work loading and setting up at the lake, but it is a lot more comfortable once that is done. State Park on Lake Eufaula for five nights for the Potato Creek Bassmasters tournament there. When making reservations, I went to their web page to make sure there was no tornado damage. It hit the airport about five miles from the campground, destroying hangers and planes, but did not damage the park. Modern “campers” amaze me. On the website comments about the campground proved people do not want to camp to enjoy the outdoors. I am not sure why they even go. They could stay home and do the same thing they do in the campground. The oddest comment was about alligators. There are big signs in the campground warning “Alligators Present, Swim at Own Risk” and there are usually several in the water late in the afternoon. One person complained in their comment that there were alligators at the campground but the park ranger did nothing about them. I’m not sure what they were supposed to do, the lake is full of them and they are wild animals, moving wherever they want in their natural environment. Another person complained there were puddles in the campground after it rained. Duh. I guess those folks wanted a nice huge paved area like a Walmart parking lot, sloped so the water runs to drains. Get rid of all the trees and dirt so nothing natural, like a puddle, is possible. Over the weekend the sites filled, many with families with children. I think this past week was spring break there. All the kids brought their toys, riding scooters, playing basketball and having faces buried in electronic gadgets. The same thing the probably do at home. One of the first things many of the folks did was put out their TV satellite antennae and set up their big screen Tv. If you are going to sit inside and watch TV, why pay for a campsite? I like being away from TV and all the other day to day distractions at home. It is nice to hear no news for several days for me. At their age I would have been fishing every minute I could. That is one thing I loved about camping at the lake, all that water so close by and I just knew it was full of fish. I still love camping, sitting by the picnic table first thing in the morning drinking coffee, then going fishing. After coming in, grilling and sitting outside is a big part of it, enjoying the peace and quiet of the great outdoors. But sometimes that is destroyed by all the noise of camper air conditioners, TVs blaring, and other non-natural sounds. This entry was posted in Fishing Ramblings - My Fishing Blog on March 30, 2019 by ronniegarrison. We are deeply saddened to share news of the passing of Darrell J. Lowrance, founder of the Lowrance brand. In addition to inventing the first recreational sonar product for anglers, the Fish-Lo-K-Tor — known fondly as the “Little Green Box”, he led the development of the first graph recorder, the first integrated sonar/GPS unit, and many others. These innovations form the foundation of today’s Lowrance products and vision. As a leader in the fishing and marine community, Darrell was a member of the Board of Directors for AFTMA (American Fishing Tackle Manufacturers Association – later to become the American Sport fishing Association) from 1978-1986, and again in 1988. He was inducted into the Bass Fishing Hall of Fame in 2013. In memory of Darrell’s work, many of the competitors at the Knoxville Bassmaster Classic last weekend wore commemorative blue ribbons during Sunday’s final weigh-in. We mourn this loss and we offer our sincere condolences to Darrell’s wife, Kathleen, and to his family. 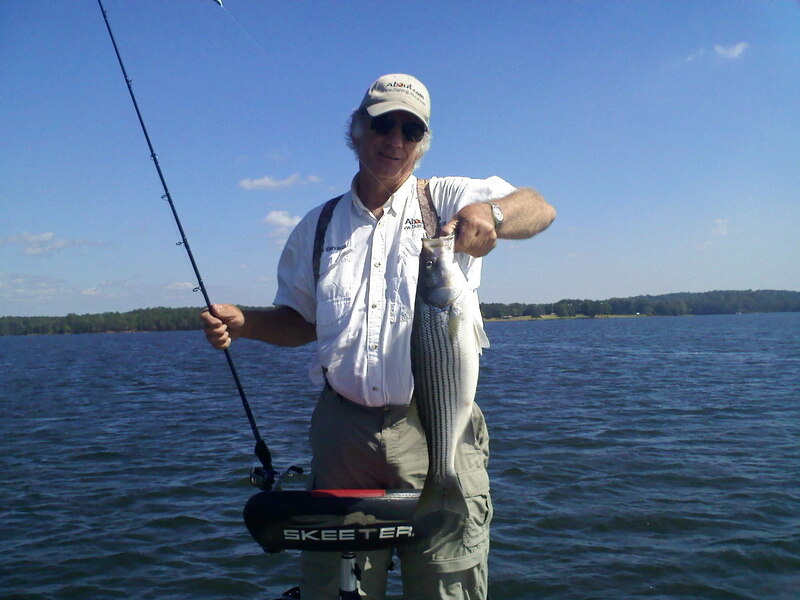 This entry was posted in electonics, Fishing Ramblings - My Fishing Blog on March 20, 2019 by ronniegarrison. When you see a bald eagle soaring overhead, floating on the air like it is weightless, you can see why it is a symbol of our nation. The bald eagle is an impressive bird, looking strong and in charge of everything in its world. The dark brown body and stark white head contrast vividly against the sky that holds it. I will never forget the first time I saw a bald eagle. I was fishing at Lake Oconee and followed it for about 15 minutes as it soared over Double Branches. Several other boats stopped and also idled along, watching it as it hunted for fish in the lake. While I was growing up there were no bald eagles in the east Georgia area around McDuffie County. I spotted a few like the one at Oconee while fishing area lakes in the late 1980s and they have gotten more numerous since then. During the 1970s there were no active bald eagle nests in Georgia, according to the Georgia Department of Natural Resources. They have made a gradual comeback since 1979 when the DNR started “hacking” or releasing young captive birds on the coastal islands of Georgia. They have spread to the extent that last year nests were found in 35 different counties in the state. During the 2003/04 nesting season the DNR found a total of 84 occupied eagle territories across Georgia and there were 67 successful nests in them. Those nests produced a total of 104 young eagles. That is an increase of 4 successful nests and 7 more young eagles than the year before. Bald eagles are some of our biggest birds, reaching a huge size. They can be 40 inches tall and have a wingspread of 7.5 feet. They probably mate for life and produce only one or two young each year. Eagle nests are amazing. They are usually built in tall dead trees on or near the water and eagles will use them year after year. Some eagle nests are huge, getting up to 5 feet wide, 12 feet tall and weigh up to 1000 pounds. They are made out of sticks and really stand out in a tree out on the lake. Although eagles will eat waterfowl and carrion, their main food is fish they catch out of lakes, rivers and the ocean. It is amazing to watch one soar high about the water and suddenly swoop down with talons outstretched, plucking a fish out of the surface of the water. It is surprising how big a fish the eagle can grab and fly away with, heading to a perch to eat it at its leisure. The most eagles I have ever seen at one time as on a trip to Pamlico Sound on the coast of North Carolina. We went into a big swampy area off a river and there were a lot of dead trees standing in it. Almost every tree had a eagle nest in it. There were probably 20 nests with pairs of eagles flying around, catching fish and taking them to their young. Ospreys are often mistaken for eagles. They live in the same areas, build similar nests and fish for food. Ospreys are smaller than eagles and are lighter in color. They breasts are speckle white and brown, unlike the dark brown breast of eagles. They are more common that eagles and you are more likely to see them on area lakes. If you are looking at a big bird from below it, and it has a light colored breast, it is an osprey, not an eagle. Eagles face a new threat. Last year several dead eagles were found around Clark’s Hill lake and it was determined they died from Avian Vacuolar Myelinopathy(AVM), a disease that attacks the nervous system of eagles and coots. Coots that are infected are sometimes eaten by eagles and they seem to get the disease from them. Not much is known about AVM and there is nothing that can be done about it at this time. Eagles were sacred birds to Native Americans and there are a lot of myths and tall tales about eagles from our history. I hope their populations continue to grow and everyone has a chance to stand in awe as a bald eagle soars by. This entry was posted in Conservation, Fishing Ramblings - My Fishing Blog on March 13, 2019 by ronniegarrison. Sitting on a deer stand on Thanksgiving Day is always bittersweet for me. I enjoy all the usual things, watching squirrels and birds, checking out the trees as leaves fall, contemplating life and the anticipation of seeing a deer. If I happen to kill one for the freezer it is like the cherry on top of an ice cream Sunday. The whole thing is good without the cherry, but the cherry definitely adds something. The bittersweet part is thinking about past Thanksgivings. As far back as I can remember Thanksgiving involved hunting. First with my daddy, following our dogs looking for quail. Later, after daddy got rid of our dogs and stopped hunting quail, one of my friends, A.T., and I would follow his pack of beagles looking for rabbits. If I could not quail or rabbit hunt, I would take my Remington semiautomatic .22 rifle and wander the woods looking for tree rats. There were no deer to hunt back then. After college I started teaching school and the four-day holiday meant fishing trips to Clarks Hill. I would fish in the morning then go into town to have a family dinner. Those fishing trips are great memories, too. Those days are gone. I know I will never be able to hunt with my dad again, and days of looking for rabbits and squirrels are over. Also gone are the huge Thanksgiving meals with my extended family. Mama had five brothers and four of them and their families lived near us. Daddy had five sisters and two brothers and some of them lived close. Thanksgiving always meant big family gatherings. I was too young to realize the importance of family, and I was always in a hurry to get the meals over, so we could go hunting or I could head back to the lake. I wish I could go back and just sit and talk with family long gone. I still get to enjoy thanksgiving dinner with my wife, mother in law and brother in law and his wife. That is great, but it too reminds me of all the family I have lost over the years. Life goes on and we adapt to changes. If you have family, enjoy every minute you have with them at gatherings, not just at holidays but at all times. But do work in a hunting or fishing trip to make those memories, too. This entry was posted in Fishing Ramblings - My Fishing Blog, Fishing With Family and Friends on March 3, 2019 by ronniegarrison.